Key speakers were uncertain of their ability to travel from New Jersey, Connecticut, Washington D.C., and Boston, even hours before start time on Thursday. Some of them could not find a way, thwarted the day before or Thursday morning. Other industry attendees, expecting to watch a show in the well-known Avenue Q theater, agreed to fill in. 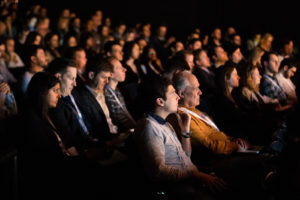 The result was a packed schedule of dynamic speakers presenting knowledge to over 300 engaged agency buyers, advertisers, podcast executives, and technology innovators. The program, co-hosted by RAIN President Brad Hill and RAIN Founder Kurt Hanson, was peppered fun and freebies. National Public Media (in support of presenting sponsor NPR), and gold Sponsor Triton Digital, gave away audiophile gear to lucky winners drawn at random. Prizes ranged from earbuds to smart speakers to a high-end home WiFi sound system. The program began with keynoters Laura Correnti and Alexa Christon, co-hosts of the ADLANDIA podcast. The theme of their podcast is finding “signals in the noise,” and they advocated that “podcasts are the bridge; audio is the destination.” They also said that experience should be the end goal. 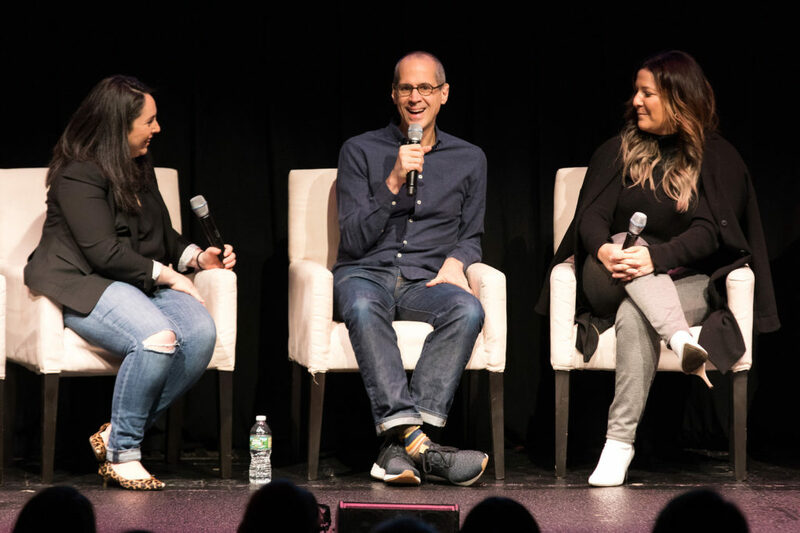 The second half of their keynote presentation was a chat with Gimlet Media Co-founder Alex Blumberg. Tom Webster (SVP, Edison Research) was scheduled to present new listening data from The Infinite Dial and Share of Ear studies, as well as from The Smart Audio Report produced with NPR. Tom could not fly into the northeast from Europe, where he spoke earlier in the week. Megan Lazovick, Edison VP and recipient of the Cynopsis Media “Top Women in Digital 2018,” took the stage. 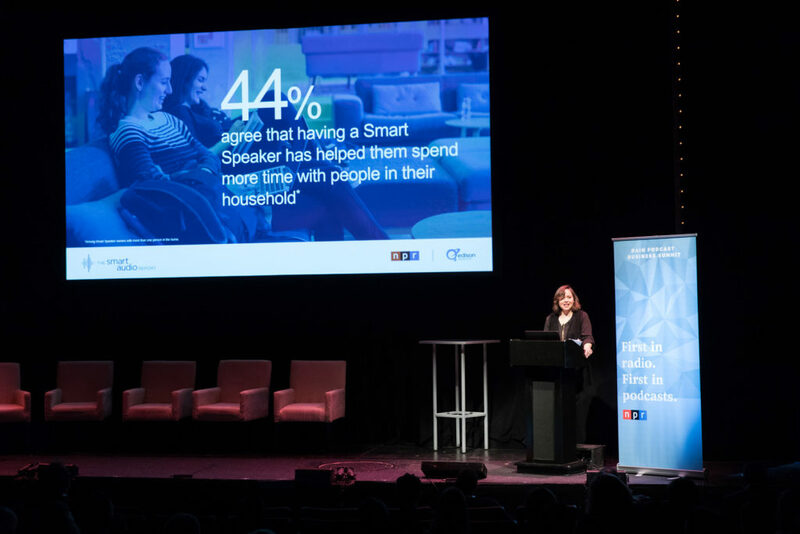 Her report covered noted that smart speakers are replacing AM/FM radio for 39% of users. Lazovick also noted that podcast listeners fill up 32% of their overall audio listening time with podcasts, a remarkable Share of Ear statistic. Two “Fireside Chat” sessions were scheduled in this event. 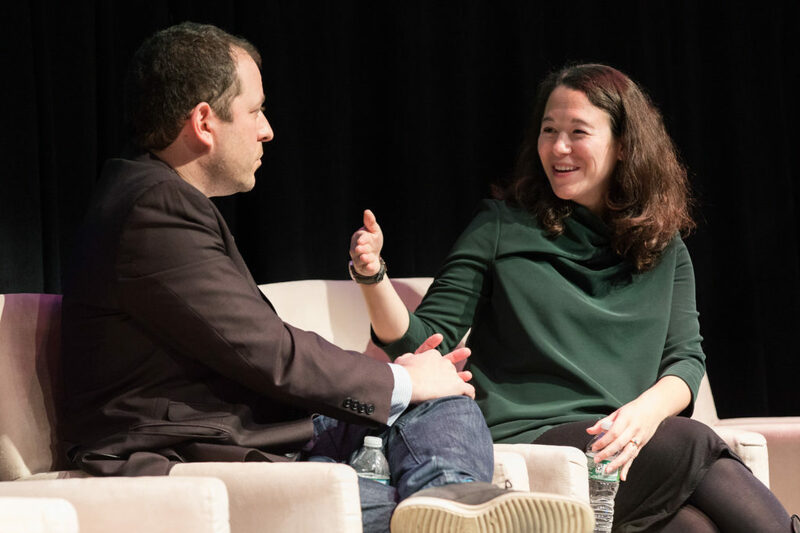 The first, with Samantha Henig (Editorial Director of Audio, The New York Times) was conducted with reputed tech/business journalist Peter Kafka (Senior Editor, Re/code), and discussed the genesis and emergence of hit morning news show The Daily. Later in the program Chris Peterson (SVP Podcasting, iHeartRadio) chatted by the virtual fireplace with E.B. Moss (Managing Editor/VP Content Strategy, MediaVillage) about iHeart’s strategy of original content matched to the scale of the largest commercial radio group. 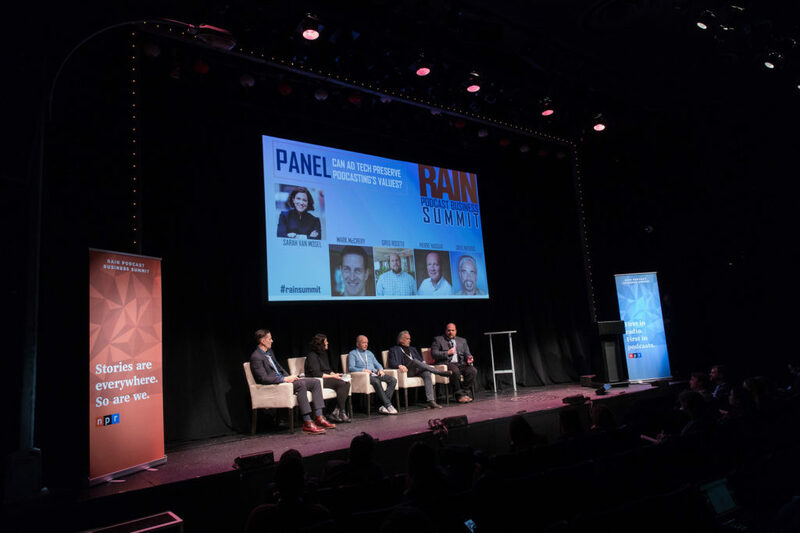 Discussion panels at the RAIN Podcast Business Summit dove deeply into key topics: podcast advertising, audience measurement, and advertising technology. 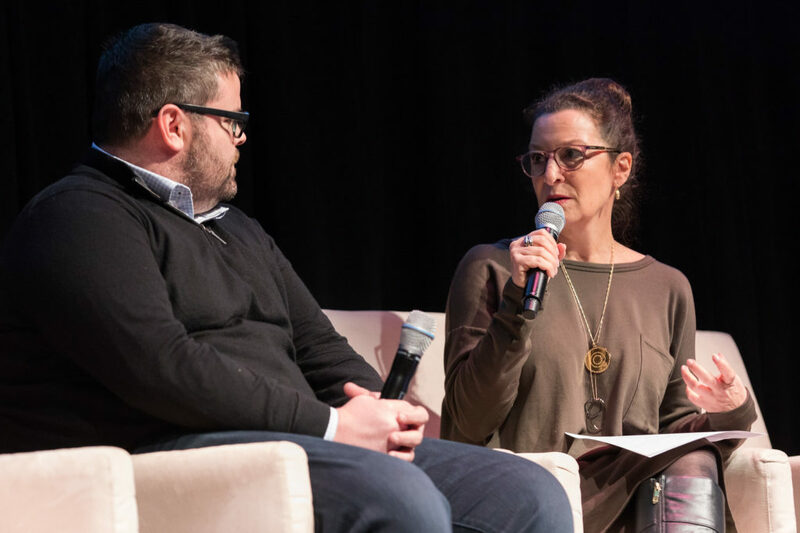 On the broad subject of advertising, moderator Gina Garrubbo (CEO, National Public Media) talked drew out agency voices Brian Tomasette (Camelot Strategic Marketing & Media) and Ilyas Frenkel (Director of Growth, Wunder), and Marshall Williams (CEO, Ad Results Media). Bryan Moffett (COO, NPM) led a lively, somewhat argumentative discussion about audience measurement, in which development of third-party standards was key. 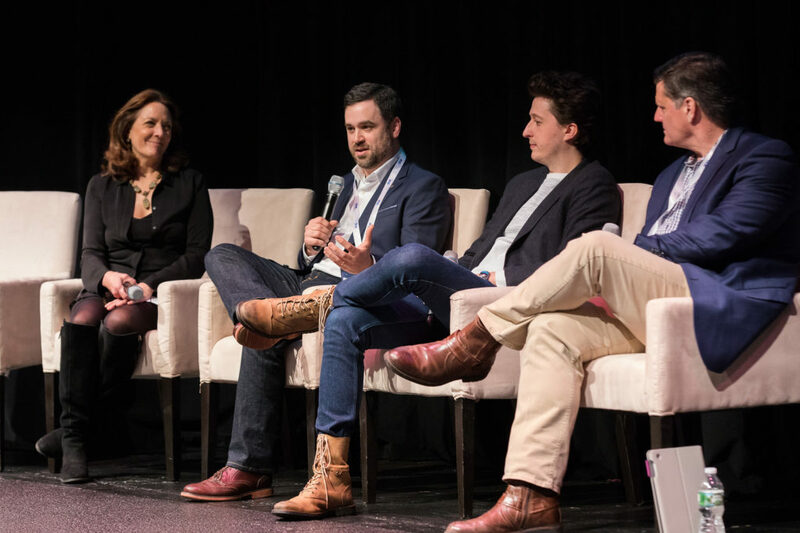 Moffett asked his panelists — Lex Friedman (CRO, Midroll Media), Joel Sucherman (Senior Director, Digital Products, NPR), and Jonathan Eccles (Director of Product Management, Listener Ad Experience, Pandora) — for predictions of podcast industry revenue in 2020. Lex Friedman had the most expansive projection: $750-million. Sarah van Mosel led a panel conversation about whether podcast advertising could keep its unique values of trust and intimacy as technologies such as dynamic ad insertion enters the advertiser toolbox. Panelists were Mark McCrery (Founder, CEO, Authentic). 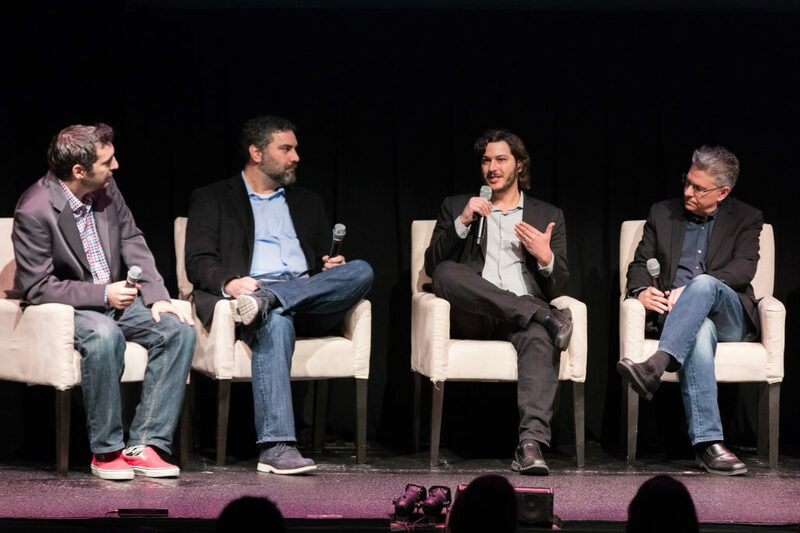 Greg Roseto (Digital Audio Investment Manager, National and Local Audio, Horizon Media) Pierre Naggar (SVP Global Demand, AdsWizz) and Greg Batusic (Chief Operating Officer, PodcastOne). 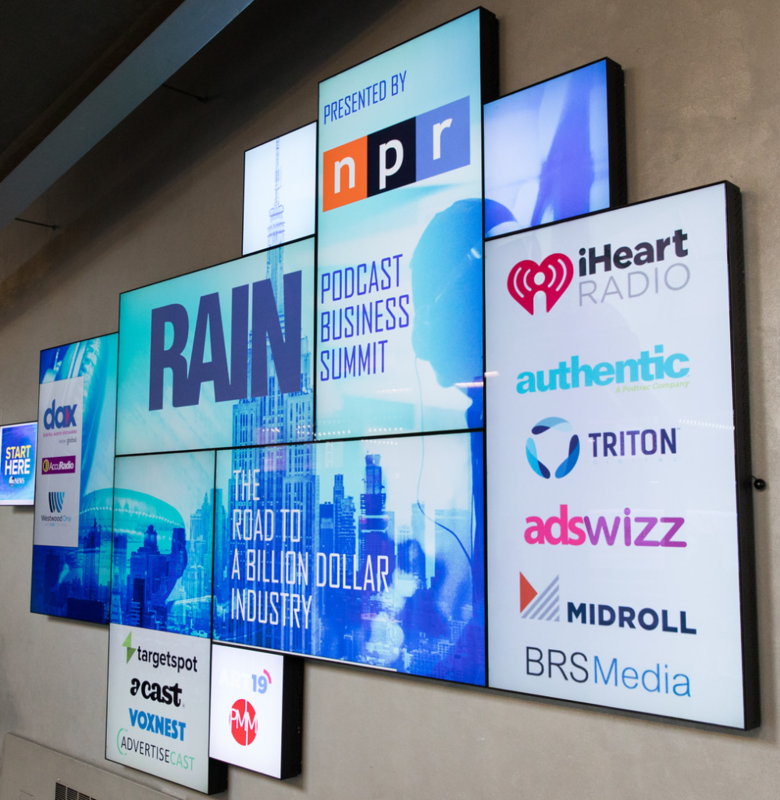 The RAIN Podcast Business Summit was photographed by noted NYC event photographer Jenna Bascom.